A game show in which a contestant is initially given his/her choice of 20 suitcases, each being held by a beautiful female model. Each suitcase holds a dollar value between $1 and $1,000,000. During the rest of the game, the contestant chooses to open additional briefcases and reveal their value. After a specified number of cases are opened, the show’s “banker” offers the contestant a calculated amount of money to trade in their case. If the contestant accepts the offer, the game ends. If not, the contestant ends up with the dollar amount in the first case. 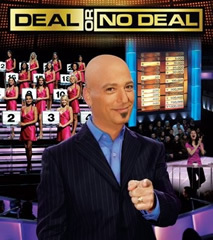 The game show is hosted by comedian Howie Mandel. Please, bring Deal or No Deal back! Check those two links. Check out those two links.